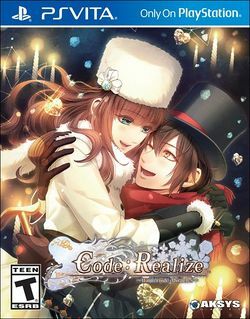 Code: Realize - Wintertide Miracles, stylized as Code:Realize ~Wintertide Miracles~ and released in Japan as Code: Realize - Silver Miracles (コードリアライズ - 白銀の奇跡, Code: Realize - Shirogane no Kiseki? ), is an otome visual novel developed by Otomate and published by Idea Factory for the PlayStation Vita and PlayStation 4. It is a sequel to Code: Realize - Future Blessings, which itself is a sequel to Code: Realize - Guardian of Rebirth. Wintertide Miracles features various scenarios that take place following certain routes in Future Blessings; the Christmas routes and Finis' Epilogue follow Finis' route, Herlock Sholmès' Epilogue follows his original route, and the Special Epilogues, unlocked only after all other content in the game is completed, follow each boy's respective Future Blessings scenario. Also featured is a side story about a mysterious opera singer with an appearance similar to Cardia's that takes place during Guardian of Rebirth's common route, as well as a "Triangle Date" feature which provides access to thirteen unique scenarios depending on the combination of boys chosen. Idea Factory published Silver Miracles in Japan on December 21, 2017, a year after Future Blessings. Its release was closely aligned with Christmas in order to coincide with the game's theme. Wintertide Miracles was published by Aksys Games in North America on Valentine's Day, February 14, 2019. It was also released for the PlayStation 4 on the same date as the Vita release following the series' first release on the console, Bouquet of Rainbows. This page was last edited on 22 February 2019, at 05:53.